User Interface and User Experience | Applied Visions Inc. Applications shouldn’t just look spectacular, they should be intuitive and easy to use— few things can affect an application’s success or failure more. While good design isn’t always recognized, bad design always is. Our user experience experts understand what makes an application enjoyable, productive, and hassle-free, and we make sure that the end product won’t result in a wave of complaints. We identify the users involved, what their goals are, what work they hope to do with your product. We interview them, do surveys, and study the user community. Once we have that information, we can then start to find the common denominators (because no single product can do it “all” – one has to pick the most important functions) and develop the guidance that leads to a successful application. And then you have to make sure you don’t kill your users with improvements. This is especially true when you are building applications for devices, because every decision is going to impact millions of devices. What the customer is doing now to solve the problem, and how they feel about it. If they’re ambivalent, because their current method (including “doing nothing”) is good enough, it will be harder to sell your solution. What else the customer has looked at, and how they felt about the solutions they found. What competitors have promised them, and what they believed or didn’t believe about what they were told. What they might pay for your product, and how they want to pay. Yes, you can ask about this. You need to know if they insist on up-front licensing, or would be open to a subscription model. How they prioritize the features and functions. Which of them are essential, which ones are “nice to have,” which ones are “standard” and “assumed,” and which ones are not really necessary. How they feel about these types of applications in general—in terms of larger trends. Do they still feel that this type of application is critical, or is interest in this waning? Are people finding other ways to solve the problem, or is the problem less critical than it used to be? 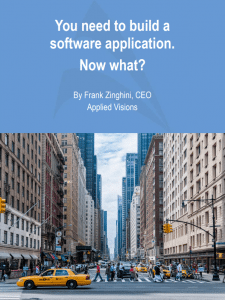 What other applications—similar to yours—excited them, and why. If you agree that customers come first when building a piece of software, and if you don’t want to build a frustrating application, we can help. If you want a user-friendly piece of software, please contact us!